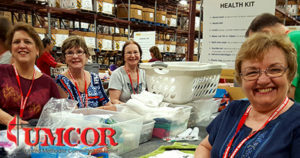 UMW is partnering with Adult Missions to involve our congregation in furnishing Health Kits for the Mission Team to take to UMCOR, Sager Brown in Baldwin, Louisiana. This year’s mission trip is April 29 – May 4, 2018. Health kits are the most needed of the kits this year and have been requested due to the massive floods and other disasters through the world. Sandy Payne is the UMW point person for the kits, and Donna Tesla is the mission team leader.